To encourage people to work their Alaskan Malamutes in the pursuits for which they were intended. To provide Certificates for those Alaskan Malamutes proven in these pursuits. To thus encourage the breeding of a better Alaskan Malamute. To establish criteria for certification of the Working malamute. To establish those specialties for which a malamute may receive certification. To establish the rules for certification. To revise the criteria as required to improve the certification program. The criteria may be modified, amended, corrected, or otherwise changed, or the program may be discontinued upon the recommendation of the majority of the Committee upon approval of the AMCA Board. The Working Dog Certification Program shall be self-supporting and thereby not be a burden to AMCA. Certification charges shall be sufficient to pay for printing and mailing of certificates and any unforeseen costs. The Alaskan Malamute shall be registered or registerable with a recognized kennel club (AKC, CKC, etc.). An ILP registration number is also permitted. Deceased Alaskan Malamutes meeting registration requirements and having fulfilled all legs of certification after January 1, 1980 are eligible for Working Dog Certification. All necessary paperwork must be completed and submitted for review to the Working Dog Committee. All races or weight pull events entered shall be open events and must meet requirements in this document. Open events are those which are not restricted to club members only and are sufficiently advertised so that non-club members may compete for a nominal charge. It is the responsibility of the dog owners to make sure that their dogs are sufficiently trained and conditioned that they pose no hazard to the health or welfare of themselves or other dogs participating in the event. Any team proven a hazard to other teams or mushers shall be disqualified from certification. Any driver/handler who displays poor sportsmanship or abuses his dogs shall be disqualified from certification. It is the responsibility of the dog owner to obtain and mail all the necessary documents, signatures and otherwise complete all requirements to get their dogs certified by AMCA. Dog does not have to run on an all Malamute team. Any dog certified by AMCA shall be privileged to use the title in any AMCA literature. Any person wishing to protest the eligibility of a dog or dog team, the qualification of an event for certification purposes, or protest any violation of race rules or certification requirements, must do so immediately following the conclusion of the event. The protest may be verbal but must be followed by a written statement to the race marshall or chief judge of the event within 10 days with a copy to the certification committee. The committee shall notify the concerned parties of the protest in order that they may file a rebuttal. It shall be the responsibility of the certification committee to decide whether or not the protest is valid by a 2/3 majority vote. Any person found guilty of willingly falsifying documents in order to certify a dog shall be ineligible for certification. (Falsifying records may consist of a dog’s name, forging documents or otherwise making false claims to certify a dog). The Working Dog Award Committee shall consist of three AMCA members, appointed by the Board of Directors, each from a different geographic location. Certification application forms may be obtained by writing to the Working Dog Committee Chairperson whose name will be listed in the AMCA Newsletter. The completed forms shall be returned to the Committee for review. Judges, or other necessary officials, may be AMCA members or other person the Committee recognized and accepts as having necessary qualifications. Application from competitive events must be signed by an event official. Officials for approving a sledding or packing excursion shall be impartial persons accepted by the Committee as having the necessary qualifications and integrity. If a club event, the witness may be a club officer or event organizer. If an individual event, the witness may be a park official, forest ranger or similarly qualified person. The mailing address of the official must be provided on the application form. Definitions *Race Marshall is appointed by and reports to the race giving club, but has complete and full charge and responsibility for the race from the time it starts through to its completion. All other officials report directly to him and are responsible to him in all matters. He has the final word and the power to cancel or stop the race under extenuating circumstances, weather or trail conditions. Can disqualify or refuse teams at the start, at his discretion. He must be experienced, capable and a responsible expert in the sport of dog racing. He will chair the drivers meeting, officials meeting and protest committee. *Time Recorder is responsible for the recording of the time made by all teams during the race. He may have an assistant known as a recorder. He is responsible to the race marshall. It is his responsibility to use proper and adequate chronographs for this purpose, and be completely familiar with the rules. *Chief Judge shall report and be responsible to the race marshall. He shall be in charge of the Judges, the Dog Marker and his assistants. He shall deal directly with all drivers and will receive any protests and or complaints. He shall be in charge of starting and finish line, and remain at this position during all heats of the race. He will examine teams at the start and finish, and has power to disqualify dogs, in his opinion, that are unfit to run. *Trail Judge shall report directly to the race marshall and is responsible for laying out, preparation of, and marking the race trail. He should be familiar with the requirements of a race trail suitable for dog teams, and do his utmost to prepare a trail that will not have dangerous corners, road crossings, etc., that can be hazardous to dogs and driver. He is responsible for patrolling the race trail during the race, and placing the trail stewards at locations as may be required. *Protest Committee shall consist of Race Marshall, Chief Judge, Trail Judge, and Time Keeper to settle all disputes, complaints and protests. To levy all penalties and disqualifications. Decisions of this committee are final and irrevocable. *Spotter or Trail Steward is a person located at corner or intersection of trail, responsible for directing teams in corrections and reporting any incorrect occurrence to Trail Judge. *Racer is a person participating in a race or races. *Trainer is a person who trains sled dogs for racing, freighting, or weight pulling. Sledding — snow or wheeled cart. Races shall be held under ISDRA rules plus any amendments created by the officiating club’s race rules, as long as they do not change the basic requirements of ISDRA rules. The applicant shall pay the costs of entries plus payment to the AMCA for certification processing. Vehicle may be snow sled or wheeled cart. Team does not have to be all Malamute. Dog does not have to run on same team each time. Certification may be achieved by any one of the following three methods. Method 1 – Racing or Cross Country *Dog must qualify in three different races. the races may be any class. the dog may run in any combination of three races. Minimum number of teams competing is three. Races must be run under ISDRA rules or the rules must have been approved by the Committee. Each heat may count as a race as long as it fulfills the above requirements. *The team must complete the race in an acceptable speed as determined by the committee. Under normal conditions this will be 9 MPH for the sprint class and 7 MPH for freight and cross country races. Under conditions of extreme weather or terrain, the Committee may accept a slower average time. *OR the team must complete the race in the top 30% of the competition. *Required distances will be determined by the class in which the dog is running. Required distances will be 1 mile for each dog on the team with a minimum of 3 miles required. 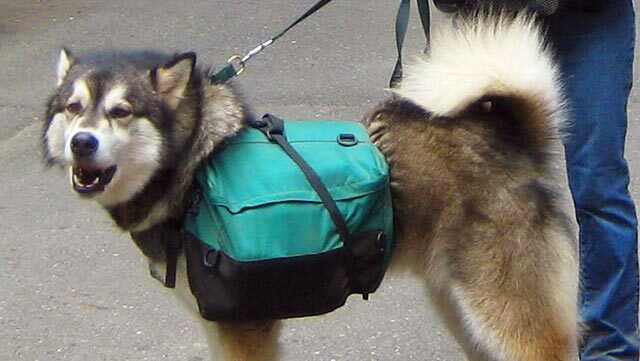 the freight class shall be a minimum of 5 miles with a minimum of 50 pounds per dog added to the weight of the sled. Method 2 – Racing Dog must accumulate a minimum of 25 race miles. The dog must have completed the course in all races considered. Races must be a minimum of 5 miles if a freight race. Distances of Method 1 apply. The dog must complete all races in an acceptable amount of time as determined by the Committee. All events must be certified by a race official or an impartial witness. Method 3 – Excursion Dog must accumulate a minimum of 40 sledding excursion miles. Dog or dogs must pull sled a minimum of 10 miles per excursion. An impartial witness must sign for form to be sent to the Committee verifying proof of distances and dog or dogs competing. Method 4 – Combination racing and Excursion One or two 10 mile or longer races may count towards the total of 40 excursion miles. Addenda Each heat shall be counted as a race for the following reasons. Heats are occasionally run to establish the top teams in each heat. The top teams or team then running in a final heat. Occasionally the first heat is completed, but musher, dogs or equipment may be too damaged to compete in the next heat or heats. A change in weather or other conditions may cause heats to be canceled. When certifying by accumulating 25 race miles, completing one race of 25 miles or more is qualifying. DOG MUST RUN SINGLE LEAD on a team consisting of 3 dogs minimum. Lead dog requirements are identical to those for working team dog. Dog does not have to lead the same team each time to qualify. Dog must run on the LEADING team if 2 or more teams are traveling together. A dog must qualify in 4 separate events. Dogs must be weighed before each event. On natural surfaces such as snow or dirt the weight pulled must equal or exceed 8 times the dog’s weight. On artificial surfaces such as concrete, carpet etc, the weight pulled must equal or exceed 12 times the dog’s weight. ISDRA, AMCA or IWPA rules must be used in qualifying for a weight pull certificate. Note: Effective Aug 22, 2014, UKC weight pulls will no longer be accepted for WWPD certification. Legs earned (except for rail pulls) prior to that date will still be accepted; however, legs earned from that date forward will not be accepted. Click HERE for more information. Dog must carry a daily initial weight equal to a minimum of 30% of the dog’s weight. This weight shall not decrease except by normal consumption of items such as food or water. Pack trips must be on natural terrain such as hiking trails or cross country. OPTION 1: Dog must pack a minimum of 30 miles. Each trip must be a minimum of 10 miles per day or an overnight camp out with a minimum of 5 miles in and 5 miles out. A minimum of one trip must include an overnight camp out. OPTION 2:Dog must pack a minimum of 40 miles. Each trip must be a minimum of 10 miles per day. Elevation gain may be substituted for mileage in the following manner: 1,000 feet of elevation is equivalent to 1 mile of flat terrain. Elevation gain will be figured as the difference between the highest and lowest points of the trip. Packing requirements shall be spread out over a minimum of 2 trips. An impartial witness must sign the form to be sent to the Committee verifying proof of distances and dog competing.